If thought that Google's new design looks terrible, wait until you see some prototypes shared by Jon Wiley, Senior User Experience Designer at Google. 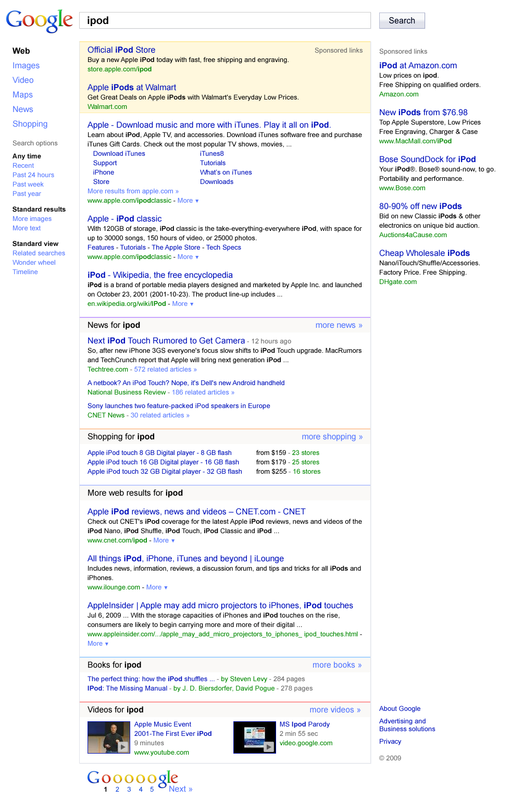 A lot of the ideas from these prototypes didn't make the cut: the blue search button that attracted too much attention, the blue background of the search results pages, showing separate sections for universal search results. "We made hundreds of prototypes and gathered feedback from user studies, Googlers and through experiments — including one of our largest visible experiments ever. In the end, we came up with a design that provides dynamic, relevant search tools on the left, while lightening and updating the aesthetics all around," says Jon Wiley. Even if the new interface is more cluttered with advanced options and I'll miss the dictionary links, I still think the redesign is an improvement. Google's search results pages look more consistent, the advanced options are more relevant and I already use them more often. 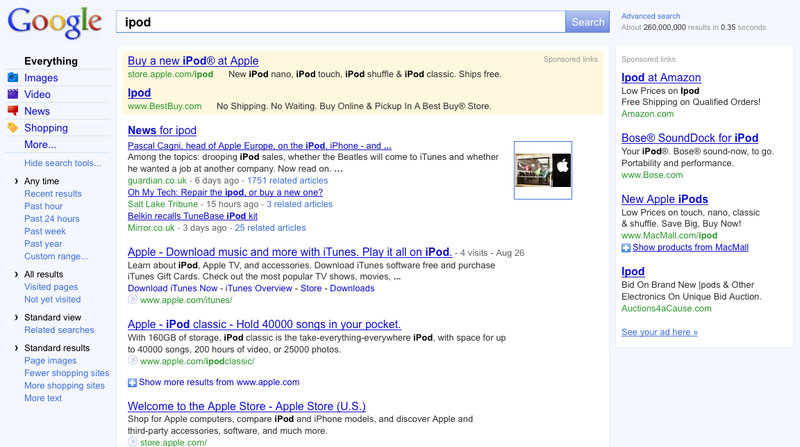 If you want to use the old interface, it's still available at http://www.google.com/webhp?hl=all. You can also try the Greasemonkey script "Hide Google Sidebar". I like the new design, and I think the next step will be changing the logo on the other Google properties and to tweak the top navigation bar to remove duplicates leaving things like Gmail and Docs, YouTube etc. Maybe a new design there as well. I actually like the light blue links in the first screenshot. The side bar blue background doesn't look bad either (well, at least in the screenshot) (IMO). I agree, the dictionary link is something I really miss. 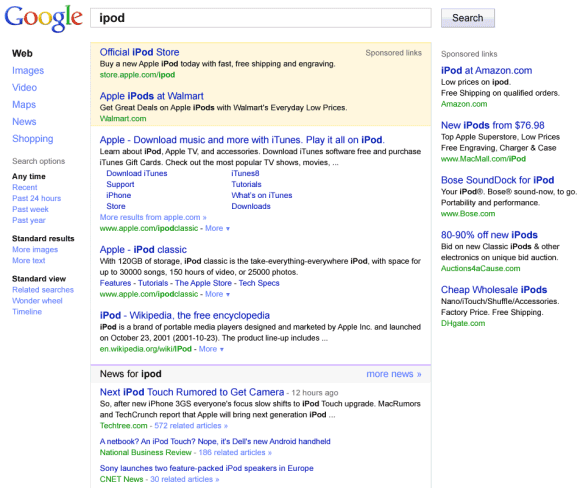 I use dictionary.com, but having the definition link in Google search results was nice. On a slightly related note, since Google redesigned its look, I hope that redesign also applies to the favicon, which is really bad looking. I like the older design. The new one makes me sick. Why are they searching apple products? I could care less how the page looks as long as I find relevant results. I hate it. Don't mind the new tools down the left side, but why scrunch all the results into the same fixed-width column no matter what the screen resolution? This is so annoying that I'm going to start looking for a new search engine that spends page real estate on actual search results, not on empty white space that forces me to scroll unnecessarily. Hopefully they won't shut down this bypass. Just an other step to less visible organic results. The left sidebar should be hidden by default. I checked out the link to the better older version and it does not have a "News" link so it is worthless. There is no search suggestions in the old page (I think because they are country-specific). So please let your "UI Designer" who created this terrible new style use it by himself, and return back the full-featured old style Google without such a terrible "eye-candies". I want the Old way back, the new way uses up valuable all the width on stuff I dont need.. is there a way to set the "old interface" as default, rather than having to type the extra bit each time?? and also, the useful "Videos, Maps, News, Shopping & Mail" has been replaced with "Dictionary & Groups" which are not useful in the slightest. I have a Wide screen monitor but have it turned Portrait view, so where as Width is not really a concern to some people. Its VERY important that its not being wasted for me. Please, let the old design as an option, this one is quite pointless. I dont use any of the left bar stuff. I am so glad I stumbled upon this site. Thank you for the link to the old Google interface. My eyes will be eternally grateful. I don't like the new look. In my opinion, a good user experience basically depends on its clarity and unity. Unfourtunately, the design of the new look just ignore both of them. Bad page arrangement: the option "Advanced Search"'s font size is too small, and too close to the big search button, looks really ugly. What's more, it's position which is under the search button--not on the button's right side, makes it more difficult to click. Why? Because when you move your mouse left or right, you just need to move your wrist, but when you move your mouse up or down, you need to move your arm. 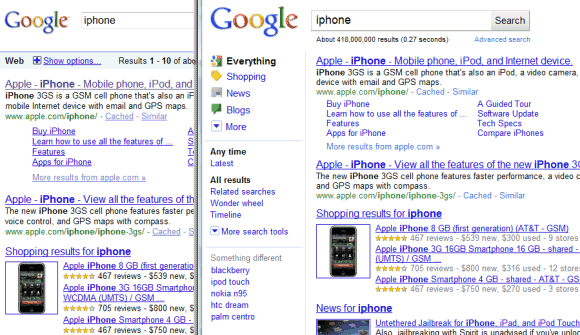 That's why the old "Advanced Search" option on the right is far more accessible than the new one. So please left more vertical space and make the page clearer. And the old look has a colored rectangle to devide the page into three main areas: two search boxes and one search results field. It's just like your common application: there are toolbar and main work area. Very very clear! But what you find in the new page is a bunch of widgets, and they are quite close to each other, really confusing! Redundant and useless items: the items on the top-left of the new sidebar is a duplicate of the menu items on the top-left of the page. And actually in the search results there are already recommended image items and news items etc. If users need these, they just click them or click the top menu items. Superabundant options make pages confusing and fat, not convenient. Ugly fonts: There are many font-sizes, even the sidebar items have two different sizes. New logo's bolder than the old logo, especially the "o" looks singeing and glare, queued very close, not pairing up the little page numbers. 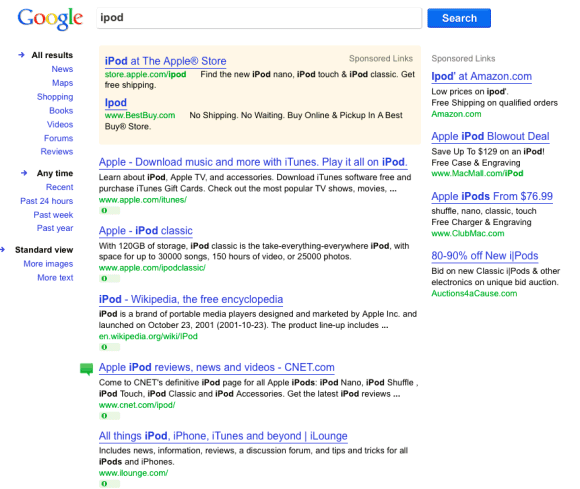 I love Google, but this time Google didn't make it right, just as I said, disappointing. Wow so much crying. I like the new design, other than not having the dictionary on search results (my guess is they're going to add that back...). The old design was a lot better then this one. I can only see this beign more user friendly for people who don't frequently use search engines which in this day of age is almost no one. It feels more cluttered then it needs to be, and I have no idea why you decided to change the look of the buttons. I particularly hate how the mouse turns into a "finger" now when clicking on the button instead of just being a button. Whoever made this new design obviously feels eyecandy is more important then the look and feel which is wrong. I feel changing it in such a dramtic way was a very bad idea because google will now lose various customers, I already know of several who have switched to bing, because of this change. 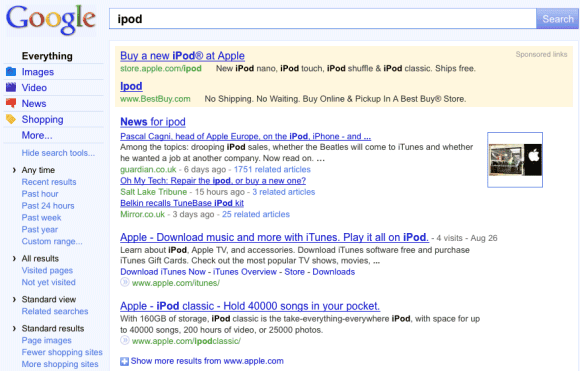 Simple beats additional features when doing searches online. Hate it. It looks pathetic. I try to use google as less as possible from now on and will continue to do so unless they decide to change back. If they don't...Sayonara! La interface de la ultima imagen que permite mostrar y ocultar las opciones a voluntad del usuario es la mejor, esa deberia ser la definitiva, a mi me estuvo saliendo esa en mi computadora y he estado feliz hasta hoy dia que limpie los archivos temporales y me ha vuelto a salir lamentablemente la interface oficial con la barra vertical que no se puede ocultar.